After baking the most ideal pandan chiffon cake using pandan concentrate made from Wendy's method, I was asked (by my husband) to extract pandan using coconut milk instead of water. By doing that, my husband thinks that this method utilises pandan more by not discarding the forgotten fragrance which still exists in the liquid-soluble and less-denser layer of the extract. Sadly, this part of the pandan extract was discarded using Wendy's method. 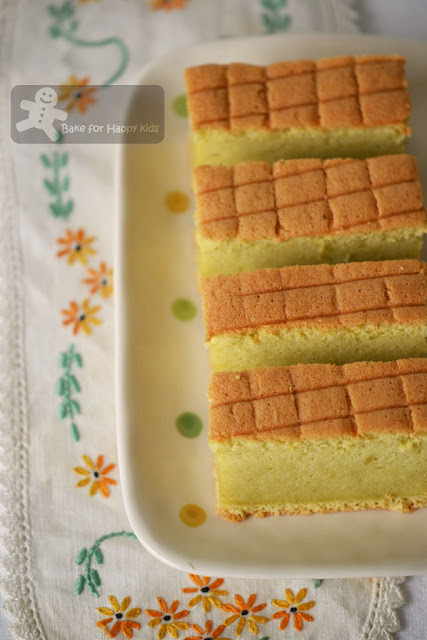 After the success of my vanilla Xiang Si cake, I'm thinking of baking another Xiang Si cake again. This time, I like to bake the pandan version. And so for this cake, I have adapted the coconut milk-pandan extraction method and use it to bake with my preferred Xiang Si cake recipe with a little tweak. 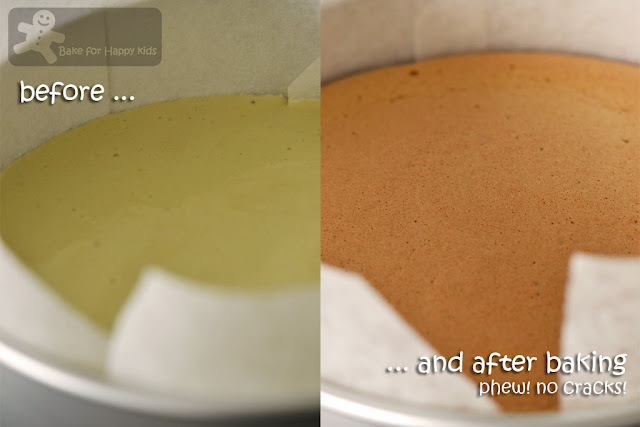 Instead of baking my usual 16 cm round cake, I doubled the amount of cake batter to bake a 20cm cake assuming that the bigger cake will be taller but I was wrong as all Xiang Si cakes in all sizes turned out to be equally short. Being a typical Xiang Si cake, this cake is indeed very cottony soft. I reckon beating the egg whites to stiff peaks should make the cake slightly taller. We like both this pandan Xiang Si cake and the pandan chiffon cake that I have baked previously but if we really really have to choose one, my family and I will prefer the tall and fluffy pandan chiffon cake but we don't know why??? No water but only coconut milk is used to extract pandan juice this time. Baking this cake can be quite nerve-wrecking. The cake shrunk a little while cooling. Thumbs up and this last slice of cake is for me ! Preheat oven to 150°C or 130°C fan force. Grease and line 20cm round cake tin. Prepare 2-3 cups of boiling water at this stage. 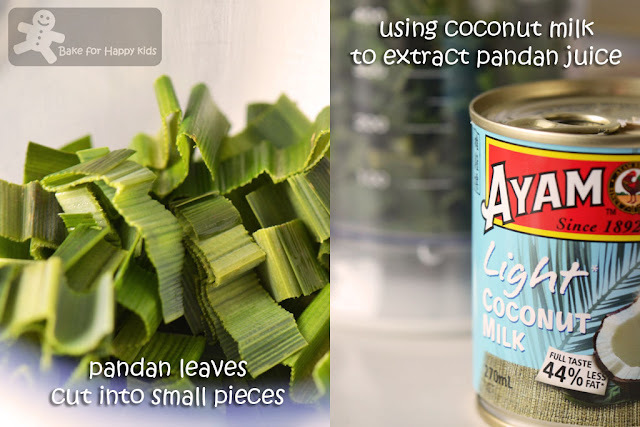 Using a kitchen scissor, cut 6 fresh pandan leaves into small pieces. Place them into a blender with 45 ml (3 tbsp) coconut milk and process. Place blitzed pandan over a cheesecloth or anything similar and squeeze out the pandan juice. 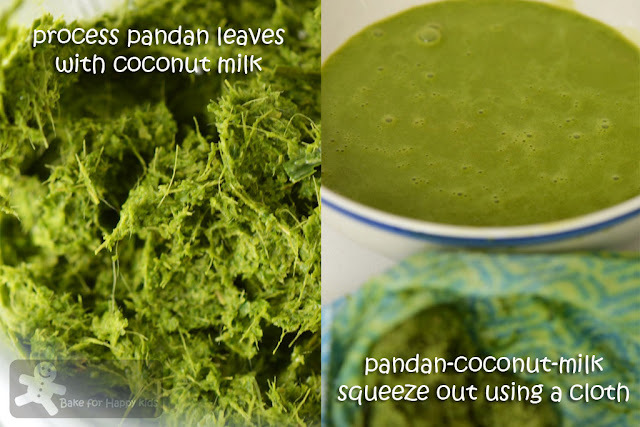 To minimize wastage of pandan, add another 15ml coconut milk to re-hydrate the dry pandan pulp and squeeze out any leftover pandan juice. If required, top pandan-coconut-milk extract with extra coconut milk to a total volume of 60ml. 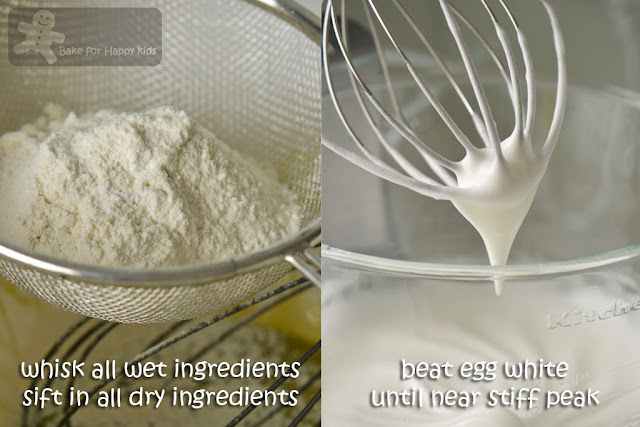 Whisk oil, pandan-coconut-milk mixture, egg yolk and whole egg until frothy. Sift in flour, salt and icing sugar. Mix well, put aside. Using electric mixer, beat egg white with tartar powder and castor sugar until near stiff peak - *See my opinion on beating egg whites. Using a spoon, fold mixture B into A by batches until well combined. Pour batter into the prepared cake tin. Tap pan lightly to remove air bubbles. Pour 2 cups of boiling water into four ramekins and place them below the baking rack at four corners. Cover the pan loosely with a foil and bake the cake at 150°C or 130°C fan forced for 1 hr 15 mins and another 15 mins or longer at 160°C fan forced for the cake develop a nice browning top according to your preference. Note: Over-baking the cake is better than under-baking it! Invert pan onto a cake rack and allow it to cool completely. Cut with a serrated knife and serve. First of all before airing my opinion, I have to clarify that I have never taste the real Xiang Si (Ogura) cake from Batu Pahat, Malaysia before. Thus, the technique that I suggest in this post is purely based on my opinion. At my first Mocha Xiang Si cake post, I beat my egg white to soft peaks and was advised by Sonia, Nasi Lemak Lover that my egg whites should be beaten to near stiff peaks, not soft peaks which eventually improve my subsequent Vanilla Xiang Si cake and this Pandan Xiang Si cake baking. However, I also realise that many bloggers (for example, Aunty Young at this post, Jozelyn at this post and Eileen at this post) beats their egg whites until stiff peaks for Xiang Si cake baking, resulting their cakes to be slightly taller and very spongy. In contrast, mine with egg whites beaten to near stiff peaks is not exactly the spongy kind but rather smoother in its texture. 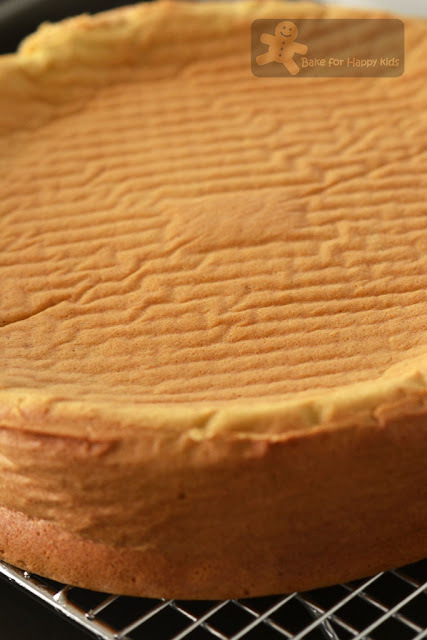 Based on my Cotton Soft Japanese Cheesecake baking, I actually like this cake baked in the form of this texture in order to differentiate Xiang Si (Ogura) cake from most typical chiffon cakes. I have learned this preference based on what Ju (Little Teochew) mentioned at her Japanese Cheesecake post. Ju notices "foam sponge" texture whenever she uses egg whites beaten to stiff peak and prefers to beat egg whites to soft peaks for less spongy but smoother texture for her Japanese Cheesecake post. Likewise, I like to agree with Ju and did the same for both my Cotton Soft Japanese Cheesecake and Xiang Si (Ogura) cake baking. Overall, I like to conclude that the cake texture and egg white beating technique can be subjective to individual taste and preference. Beating egg whites to both near stiff peaks for Xiang Si (Ogura) cake baking is the preferred option for me. Amongst all pandan Xiang Si cakes that I have seen, I am most impressed with May's at this post as she has baked hers ultimately with nicely-defined green zebra strips! - Wow! Hi Zoe, That's a great idea using coconut milk to extract pandan juice. Your cake looks so soft and moist and I can imagine just how fragrant it must be and how I wish I can have a slice of your wonderful cake, right now!. Just the right time for tea-break right here and now! I made this too without placing a waterbath at the bottom.... the cake cracked a little. Personally I still prefer the chiffon cake to this ogura cake. Sounds wonderful. Never trued a cake like this one! this ogura cake really not easy to handle but with big satisfaction when the cake turn out perfect with no cracking surface. The texture looks really nice, moist, soft and fluffy. I still have not made Ogura cake! A long list of "to-try"!! I can imagine the fragrance and the softness of this cake. Why pandan chiffon cake? I guess it is an evergreen favourite that we all grew up with, and nothing can beat old favourites! Ogura is perhaps still "new" to us ! LOL! Love the texture of the cake. I have to try out Pandan. Heard a lot about it. I m waiting from my friend to return from Malaysia to bring back this paste. 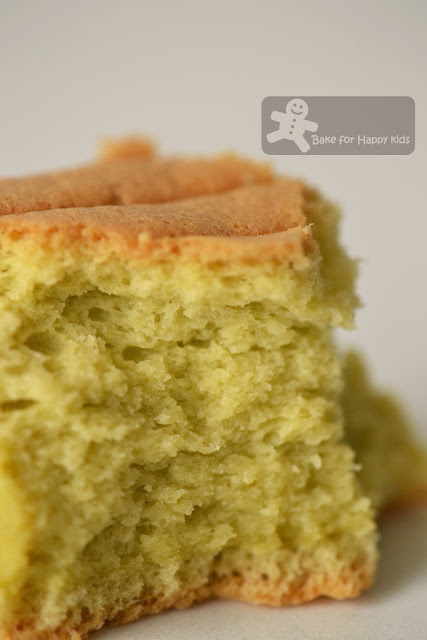 Zoe, ogura cake is my all time favorite cake!!! But didn't bake it for a while, miss (xiangsi)it so much :) Yours is beautifully done!!!! Wat a lovely texture! Feel like grabbing it frm my monitor and take a bite! Going to try this during the weekend. Zoe, I can literally smell the fragrant pandan & coconut! Would love to bake this, hopefully this month! Thanks for the sharing! I like anything with coconut in them, & I can almost smell it from my screen. Lol! Happy Mid-Autumn Fest, Zoe! Last time I made them it was too watery and soft, will need to try your recipe soon! Hi Zoe , what a gorgeous cake , so light and yummy , I always drool when I visit your house thanks for sharing :). I love the flavour of pandan! Don't think we can get the fresh leaves here in Calif, but I'll have to look for them, maybe at a big Asian market. I don't even know where I'd find pandan here! I've never heard about pandan :D I like this recipe! Ogura cake is something new to me. Will try it out one day. Pandan is very aromatic and tastes wonderful. But too much of it gives me headache...lol. I have an abundance of pandan plant in my garden. Your cake looks so soft and so inviting, Zoe. Perfect for tea. Adding in coconut milk sure increase the aroma of the cake! This is definitely a thumb up! I really like the effort you put into your recipe. Your thoughts on beating egg whites, for example, is good reading - very instructive and thought provoking. I've never worked with pandan - I need to sometime. Or rather, persuade Mrs KR, the real baker in our house, to work with it! Good stuff - thanks. I love this cake too. The texture is so smooth & spongy. i have baked ogura cake once and i can also tell you that it was nerve wrecking too..i remember i beat the egg whites till stiff , it was spongy but at the same time, i also encountered some difficulty folding the stiff egg whites into the rest of the batter.